Bakewell-Tottenham traybake | How to be the hero of your own kitchen! Act 1. The Quaker side. Quakers have been in Tottenham (North London) for 300 hundred years. Quakers do not have a traditional creed and that each person has direct access to God. Quaker women there used to bake used to bake and sell tray bakes, topped with pink icing traditionally died with mulberries off the tree in the burial ground (for extra flavour?). It was then sliced in squares and sold. Here’s where things get interesting, the Tottenham Hotspur Football Club started in 1880 but it wasn’t until In 1901 when dozens of square slices were given away free to local children to celebrate the Club’s first victory in the FA Cup Final. It has since then been associated with the Football Club and is a popular treat for parties and picnics. Bakewell was the old capital of the Peak District, founded in 1330, this small town is surrounded by forests near the banks of the River Wye. For centuries it has been a favourite tourist destination. But it is also famous for its desserts, specially the Bakewell Tart/Pudding. There is certain confusion about them. The recipe has evolved over the centuries, and the very Eliza Acton and Mrs Beeton have their own versions for a Bakewell pudding. From a pudding in the sense of a creamy, thick dessert the recipe changed to a layered baked tart, tartlet or traybake with a shortcrust base, the next layer is a strawberry compote or jam then topped with an almond sponge. 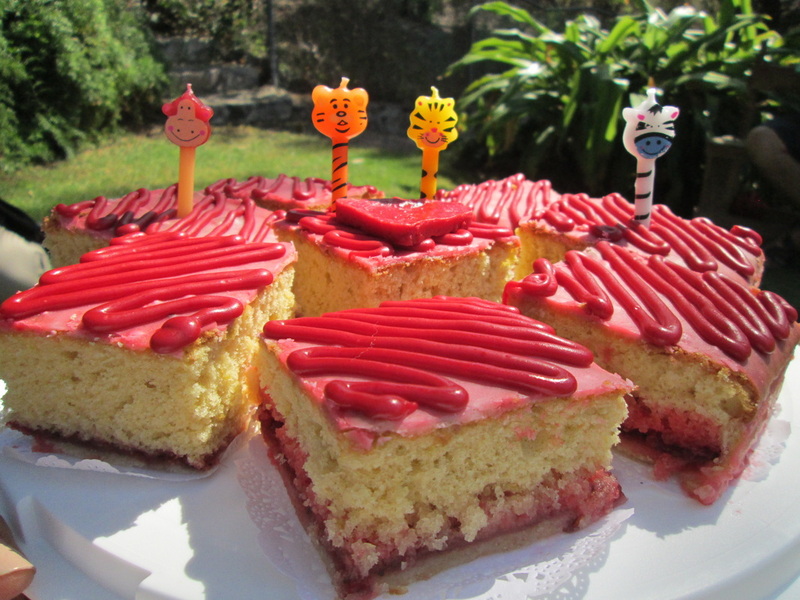 Sometime ago, I made a birthday traybake that resulted in a combination of a Tottenham cake and the Bakewell tart. It is a great idea for a picnic, easy to carry, slice and eat. Prepare just like you would any standard shortcrust. I found it easier to roll out and place it into a greased and dust mould. Pop it into the freezer for 15 minutes, don’t forget to pierce the base with a fork. Cover with tin foil or baking parchment and baking beans, or rice. Zest of 2 big lemons. Mix all the ingredients in a big bowl beginning with the wet ingredients, then sift the flour and baking powder. Use an electric mixer to quickly achieve an even and smooth batter. When the crust is cooked, let chill for 5 minutes then spread the compote trying not to put too much syrup and cover the bottom evenly. Then *gently* pour the batter into the mould trying not to mix the compote but rather covering it, level it with a spatula. Bake for 35minutes and let cool for 2 hours minimum. 1 tbsp dried lavender flowers. Use a tall iron pot and cook for 20 minutes, be careful not to burn yourself, keep a medium heat so it doesn’t splatter too much and stir gently but frequently. Transfer to a sterilized jar and let it cool completely. Then put the lid on and keep it in the fridge. 2 drops of red food dye. Juice of the 2 lemons. 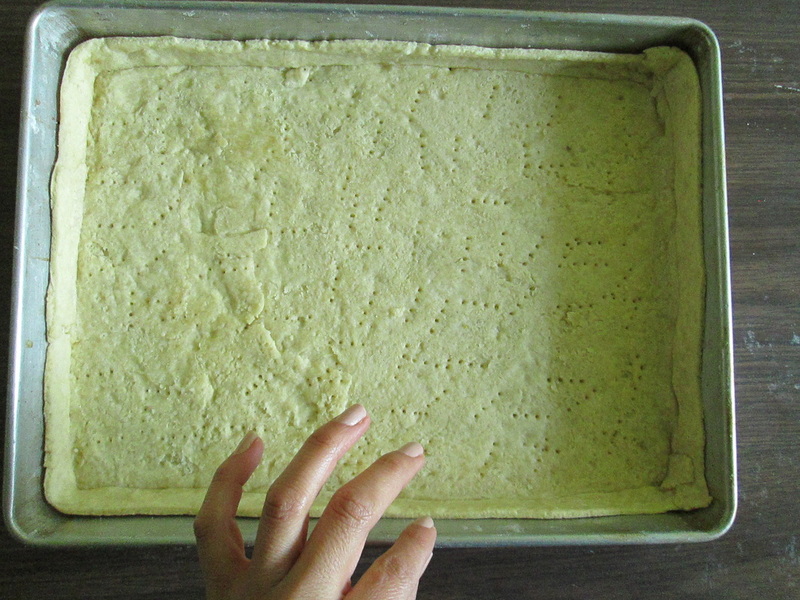 In a small bowl combine all the ingredients and apply with a spatula on the surface of the cool tart. If you don’t wait long enough it will melt, so be patient and wait till the tart is totally cold. Leave the icing dry for at least an hour. 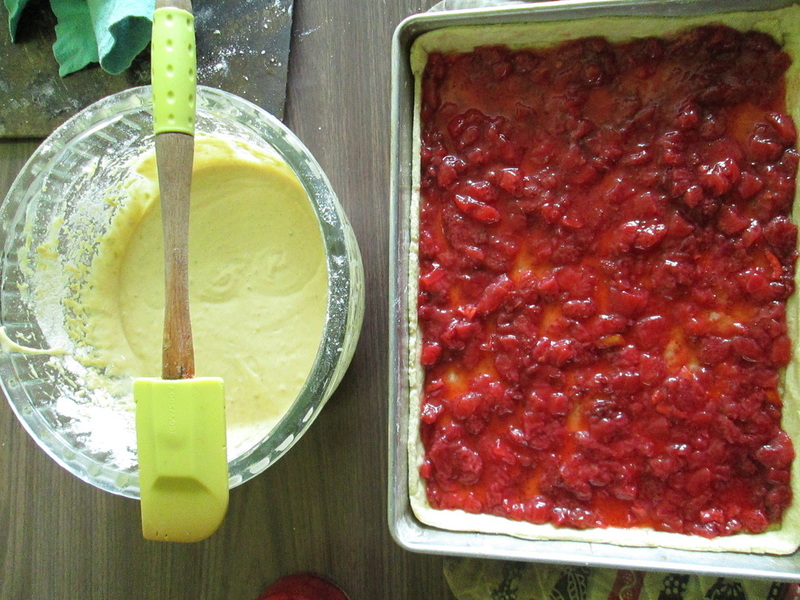 Once the icing has set, slice the tart into square portions and transfer to a rack. In a small bowl put the chocolate and cream on a bain marie until they’re both completely incorporated. Turn the heat off and keep moving the chocolate with a silicon spatula for about 4-5 minutes until it begins to cool but remains “fudgy”. 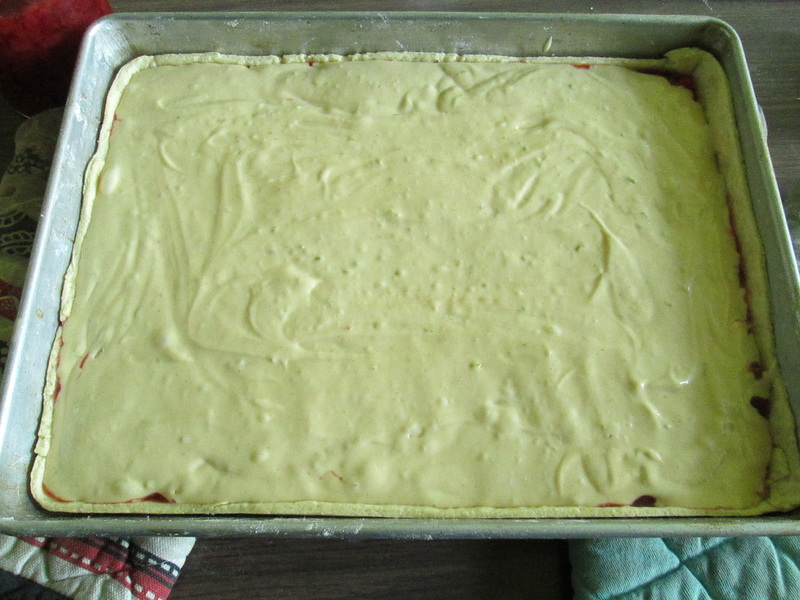 Transfer to a piping bag (use the smallest decorating tip) Decorate the squares with diagonal stripes. If your kitchen is cool, let it set there. If not, you can pop the squares into the fridge.